Our specialty is the Door County fish boil, featuring Lake Michigan whitefish caught by local fishermen and cooked outside over an open fire, just as it was one hundred years ago by the Scandinavian settlers of the Peninsula. Fresh fish is cut in chunks and cooked in boiling water with small red potatoes. Salt is the only spice used. Fish oils rise to the surface of the boiling cauldron, and when the fish is perfectly done, our Master Boiler tosses a small amount of kerosene on the flames under the pot (as shown above). The great burst of flames causes the boilover, spilling the fish oils over the sides of the pot and leaving the fish steaming hot and ready to serve. Inside, the fish and potatoes are served with lemon, melted butter, our garden fresh coleslaw, homemade breads and homemade Door County cherry pie for dessert. Imported and Wisconsin craft beers, wines and a variety of soft drinks are available to enjoy with your meal and while you watch it being prepared on our patio. Roasted chicken is available for non-fish eaters. 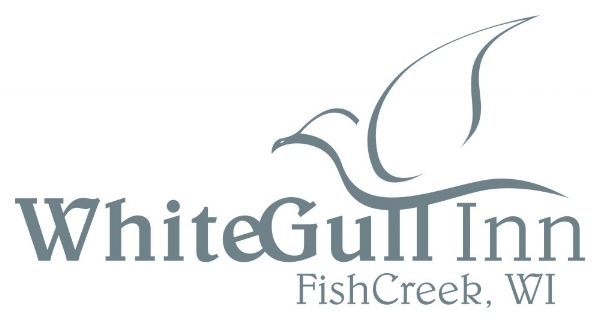 The White Gull Inn's famous traditional Door County Fish Boils are served Wednesday, Friday, Saturday and Sunday evenings from May through October and on Friday evenings the rest of the year. Reservations are recommended. Baked chicken is available for non-fish eaters.